Chicago brick pavers were preserved while securing the pool fence. This pool fence installation was conducted at a historic 1920s Spanish home in Coral Gables, FL. Our senior clients were no strangers to Protect-A-Child. They had enjoyed a 1st-generation Protect-A-Child removable pool fence when their children were still young and learning to swim. Today, they are proud grandparents and chose to provide the safest environment for their grandchildren, in the same home where they raised their children. They chose to upgrade their removable pool fence to the latest, above-bar standard that Protect-A-Child offers, which even exceeds the Miami-Dade pool barrier code. This not only provides peace of mind for the grandparents, but also for Mom and Dad while the kids are with Grandma and Grandpa. The client’s pool deck was adorned with beautiful Chicago brick pavers, which are notoriously brittle, due to age. These pavers are from old brick buildings of Chicago that have since been torn down, and the brick has been repurposed. Therefore, we had to employ extreme care and caution during the installation process to ensure no damage to the pool deck. We enjoy working with our clients not only to exceed their pool safety needs, but also because we love learning about the families behind the fences. 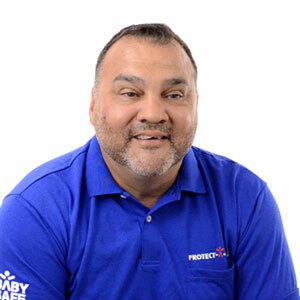 Protect-A-Child is a company whose job it is to care. Check out some of our pool fence reviews to hear what our customers are saying about us. Looking for a removable pool fence or other safety fence solutions? Contact us today at (305) 496-4219, or fill out the form below for your free quote!